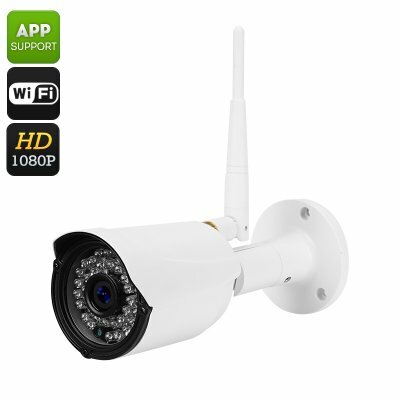 Successfully Added Full HD Wireless IP Camera - 1/2.5 Inch CMOS, Full HD, IR CUT, Motion Detection, 1080P, Remote Phone Support, 30M Night Vision to your Shopping Cart. This wireless IP camera offers remarkable features at an inexpensive price so you can have peace of mind with full HD video surveillance night and day. With top notch 1/2.5 inch CMOS sensor, this wireless IP camera gives you superb footage with video recordings at 1080P. Added to that the motion detection and you have a suitable security setup able to meet a range of needs. Whether it is for your home, shop or business this Wireless IP camera brings easy installation and sharp video quality day as the 36 IR LEDs support night vision at 0.01 lux lumination, for up to 30 meters. This IP camera doesn't require any subscriptions to cloud storage or monitoring services and the captured footage can be stored locally on the camera with its 32GB of storage option or on your computer. With adjustable motion detection, the camera can cover a preset area and will send an email alert if trigged by an unauthorized presence. This allows you to keep tabs on your home or business without needed to view the live video feed throughout the day. 36 IR LEDs provide a strong night vision allowing this IP camera to operate in low lighting conditions of 0.01 lux and still provide clear recordings of objects and people up to 30 Meters away. Having ONVIF compatibility ensures the camera will interact well with other security devices so you can easily add this camera to an existing network or upgrade your security at a later time and know the camera will still work. This high definition Wireless IP camera comes with a 12 months warranty, brought to you by the leader in electronic devices as well as wholesale IP cameras and security gadgets..